What Happens When He Throws a Rock? I am working on the first draft of book three in the Lost Children of the Prophet series. (No. I don’t have a name for it yet. I’m sure I’ll find the name sometime soon.) I wrote a scene I’d like to share with you, but remember this is rough, I’ve done no editing on it yet. You may wonder the things that helped me write this scene. Many years ago when I was a little girl, my brother had a friend who lived across the street from us in our small town. One day, this friend wanted me to see a rock he thought was particularly pretty. Instead of running it across the street and placing it in my hand, he threw it to me. I, of course, caught it on my head, not in my hands. In January, we visited our son in Arizona. He took us to a river purposely kept low to save water during the winter. 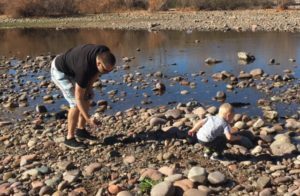 He and his little boy stood for almost an hour throwing rocks into the river. 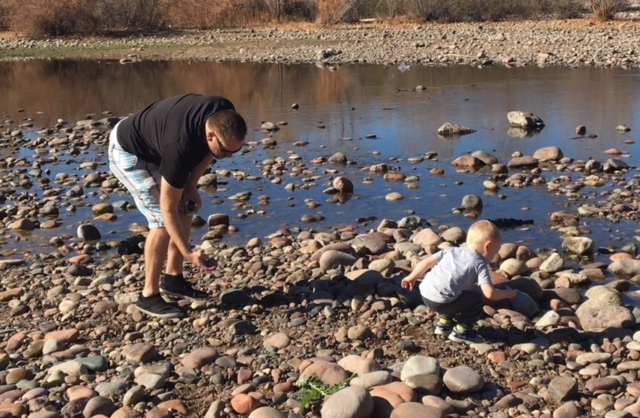 I stood for a long time watching father and son throw rocks into the water. As I watched, I wondered how I could include this in my books. “That does not sound safe to me.” Daphne glanced at David, then faced forward to keep her eyes on the road ahead of her. “And then he did not catch it?” Daphne asked. She guided the mules around a rock that stood in the center of the road. “Good boy, Jack,” she called out to the mule. David caught up to her. David stared at the ground between the wagon and his horse. He swallowed and cleared his throat. Daphne glanced his way, then stared down the road. She sat in silence, waiting for David to find the words. David cleared his throat and spoke once more. “I stepped back with one leg and pulled the rock next to my ear. I flung that rock as hard as I could to Kimnor.” David swallowed again. “He didn’t catch it. It moved too fast. He lifted his hands to catch it, but he missed it. It hit him on the head, here.” David pointed to a spot above his eye and dropped his hand. Previous PostDoes it Matter Where Eden Was?Next PostWho Do You Honor This Mothers Day?